Atlantic Site Sample 00056. Photo on left is from Buena, NJ. Sample taken June 25, 2009. Substrate was lichen on brick wall. 39 DEG 30.821 N, 074 DEG 55.541 W. Elevation 101 Ft.
Bergen Site Sample 00032. Photo on left is from Oakland, NJ. Sample taken June 4, 2004. Substrate was lichen on tree bark. Possible "Hawthorn" tree. Leaf sample taken and pressed. 41 DEG 00.150 N, 074 DEG 14.638 W. Elevation 418 Ft.
Site Sample 00042. Photo on left from Unionville, NJ. Collected on Jan 11, 2006 from Maple tree lichen on bark. Maple tree assessment based upon dead leaves on ground and tree structure. 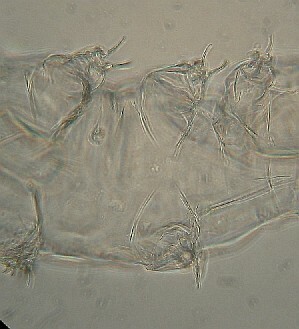 Two types of tardigrades found- Milnesium (top left) and Ramazotius (bottom left). Found in suspension made on Jan 13, 2006. Site location- 40 DEG 01.118 N, 074 DEG 43.930 W, Elevation 84 Ft based upon GPS. Camden Site Sample No. 00046. 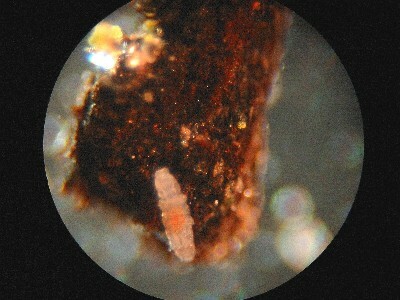 Photo on left of tardigrade from scraping of moss on bark in Blue Anchor, NJ. Collected on 08AUG07, and suspension made on 14NOV07. Permanent slide made 17NOV07, using double coverglass mount in PVA and Cytoseal 60. This is a stacked combination of 4 photos using Helicon Focus program, and Sony Digital camera. 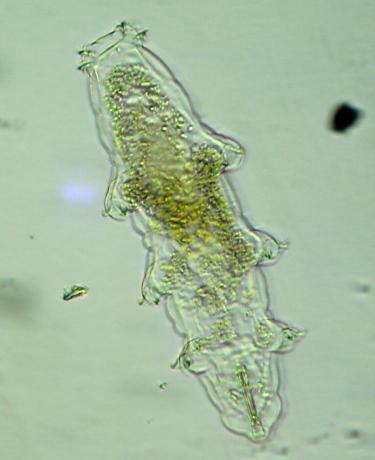 Photo taken of tardigrade in PVA, and it looks like it is molting- shedding its husk. Photo using oblique lighting, and 10WF objective with 10x Achromat. Location 39 DEG 39.604 N, 074 DEG 52.708 W. Elevation 139 Ft, using GPS. Cape May Site Sample No. 00045. 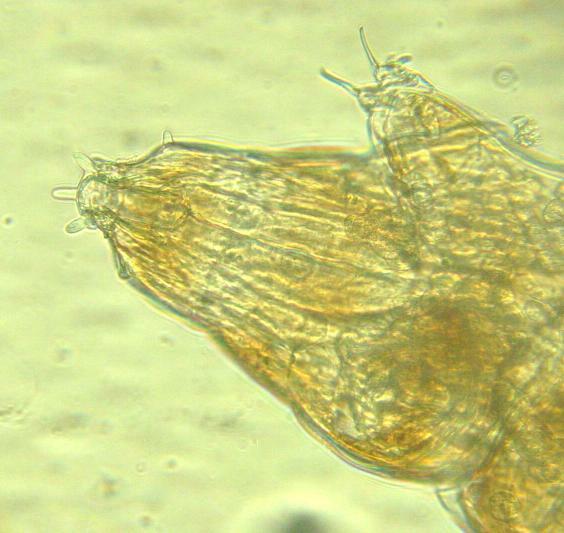 Photo on left of tardigrade from scraping of bark from American Holly (Ilex opaca) in So. Seaville, Sea Isle City, NJ. Collected on 04MAR06, and suspension made on 02DEC07. Looks like Macrobiotus. Permanent slide made 10DEC07, using double coverglass mount in PVA and Cytoseal 60. This is a stacked combination of 4 photos using Helicon Focus program, and Sony Digital camera. Image "reversed" in color using photo program. Location 39 DEG 10.893 N, 074 DEG 43.400 W. Elevation 4 Ft, using GPS. Cumberland Site Sample No. 00052. 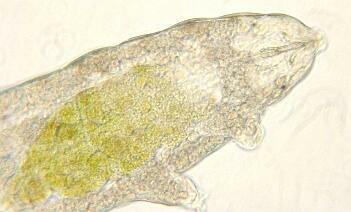 Photo on left of tardigrade from scraping of lichen from headstone in Bridgeton Cemetery, Bridgeton, NJ. Collected on 25SEP07, and suspension made on 14OCT07. Definitely Milnesium. Permanent slide made 25OCT07, using double coverglass mount in Hoyers and Cytoseal 60. This is a stacked combination of 4 photos using Helicon Focus program, and Sony Digital camera. Location 39 DEG 25.736 N, 075 DEG 14.824 W. Elevation 86 Ft, using GPS. Essex Site Sample No. 00035 collected on 05AUG2004. Photo on left is of West Orange, NJ tardigrade. Definitely Milnesium. Also found in suspensions were Minibiotis. Lichen scraped from bark of Scarlet Oak (Quescus coccinea). Suspension made 10MAR2008, and tardigrade found on 11MAR08. 40 DEG 46.072 N, 074 DEG 15.122 W. Elevation 216 Ft using GPS. Site Sample 00047, from Downer, NJ collected on 08AUG07. Photo left taken on 10AUG07 from suspension made on 09AUG07 appears to be Macrobiotus. 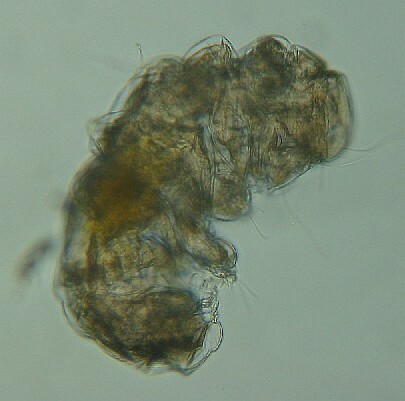 Tardigrade immediately placed into PVA preservative, and permanently mounted on slide before photo was taken. This is a multiple image photo with Helicon Focus stacking program made from 4 photos. I'm noticing lens flare now, in all of my shots with the new Sony digital camera. Although I'm getting more megapixels (7 mp), the lens flare is a negative for this camera. 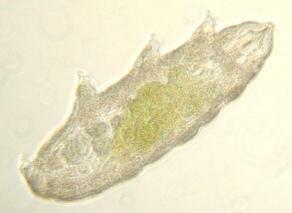 Photo below, in Darkfield, of another tardigrade found in this same suspension on 13AUG07, and mounted in Hoyers. Also staked from 4 photos. Substrate was White Oak tree (Quercus alba) and scraping was taken of moss and lichen on bark. Location 39 DEG 41.349 N, 075 DEG 00.845W, elevation 91 Ft per GPS. Hudson Site Sample 00050, from Liberty State Park, Jersey City, NJ collected on 06SEP07. Photo left taken on 03NOV07 from suspension made on 27OCT07. 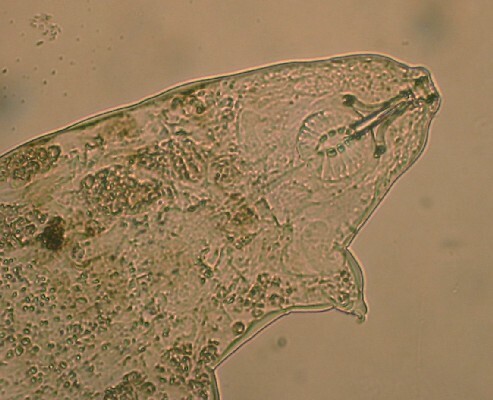 Two tardigrades (in water) appear to be Macrobiotus and Minibiotus. Tardigrades placed into PVA preservative under double coverglass, for permanent mounting on slide after this photo was taken. Both PVA and Hoyers tend to clarify specimens almost immediately, thus I took these photos while tartigrades in water (See Bridgeton 00052 Cumberland Co. above for clarifying effect of mountant). Site sample was bark scraping (not much noticable lichen at all) from London Plane Tree, a type of Sycamore, Planatus x acerifolia. Location 40 DEG 41.655 N, 074 DEG 03.514 W, 0 (zero) ft. per GPS. Mercer Site Sample No. 00041, from Robbinsville, NJ. Eyepiece 10xWF and objective25x Zeiss achro. Permanent slide made 17JAN08, using double coverglass mount in PVA and Cytoseal 60. This is a stacked combination of 4 photos using Helicon Focus program, and Sony Digital camera. Camera camera was zoomed in to enlarge the specimen in the field. Sample taken 01SEP05 from ground moss. Location 40 DEG 13.703 N, 074 DEG 37.183 W, Elevation 67 Ft. (GPS). Site Sample No. 00025. 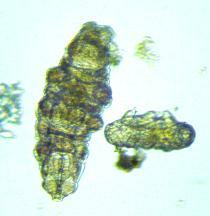 Photos on left are of East Brunswick, NJ tardigrade("Adler"). Eyepiece 10xWF and objective20x achro (top) and 40x achro (center and bottom). Canon A40 digital camera was zoomed in to enlarge the specimen in the field. Top two photos clearly show mouthparts and claws, indicating this is a Macrobiotis. Top left photo shows close up of head and mouth parts using crossed polarization for a nice effect that illuminates the stylets. Stylets are obviously bi-refringent. 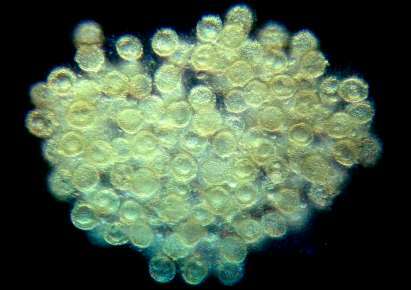 Macroplacoids look like that of Macrobiotus harmsworthi. 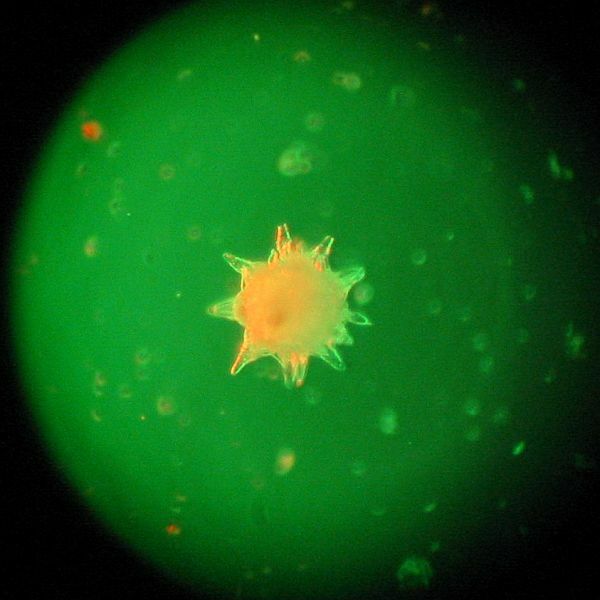 Observation and photos taken 25DEC03, with tardigrade in water under cover glass. Sample taken 19NOV03 from ground moss. Location 40 DEG 26.881 N, 074 DEG 26.643 W, Elevation 71 Ft. (GPS). Below photo, of egg cluster. Site sample 00058, Woodbridge, NJ of 6/26/09. Used 40x Lomo objective and 10x WF eyepiece. Eggs mounted in PVA under coverglass. Site Sample No. 00008. Location is Morris Plains, NJ. 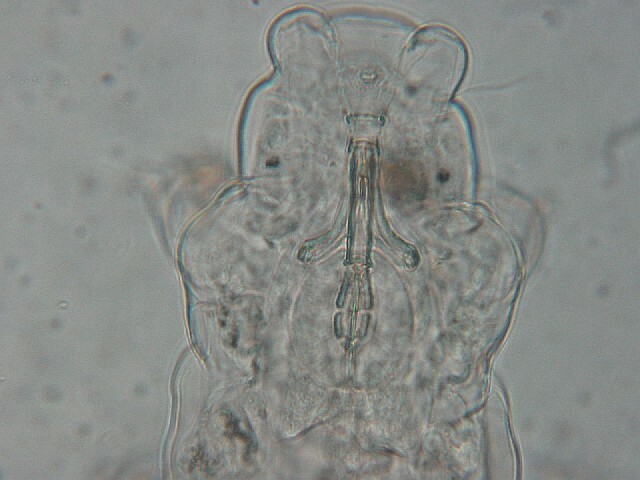 Photos on left are of Metasequoia tardigrade No. 1 ("META1"). 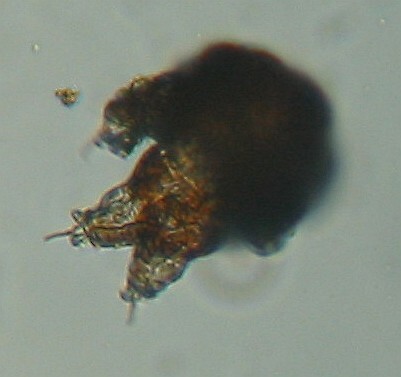 Top- Eyepiece 10xWF and objective LOMO 20x Phase Contrast- shows body shape and claws. Canon A40 digital camera was zoomed in to enlarge the specimen in the field. Neutral Density#2 filter used. 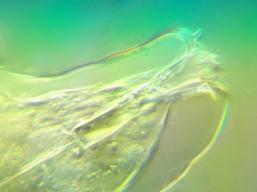 Bottom left close up using 40x Phase objective and 100x Phase stop - shows mouthparts and eyes. ND#2. This specimen measured 370 microns. Observations showed the double claws and similar mouthparts to possible Macrobiotis harmsworthii. Sample taken18APR01, from Metasequioa glyptostroboides (Dawn Redwood) tree bark. 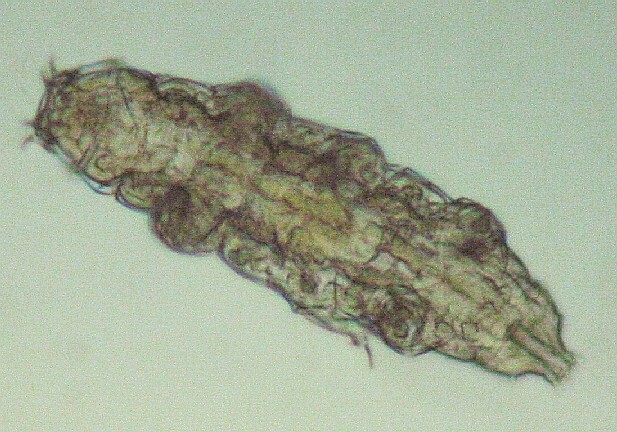 This bark sample was kept in a zip-lock plastic bag for two years, and it took 3 weeks of soaking to re-hydrate the tardigrades. Observation and photos made 06MAY03. Site location 40 DEG 50.455 N, 074 DEG 28.541 W, Elevation 413 Ft (GPS). Site Sample No. 00029. Sample from Tom's River, NJ. 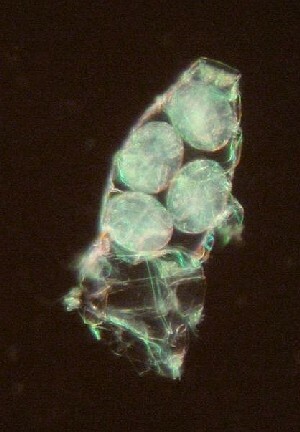 In photo on left, tardigrade eggs in shed husk or cuticle (molted skin of a female), observed moving slightly, therefore viable. 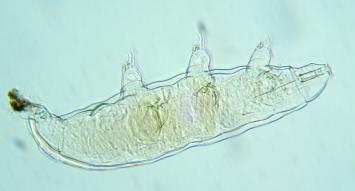 Also observed in the same sample suspension was a live tardigrade (below) which looked like Milnesium based upon claws. 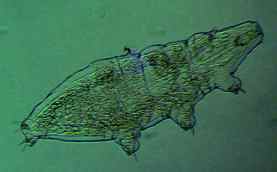 Milnesium also is known to lay eggs in the shed cuticle. 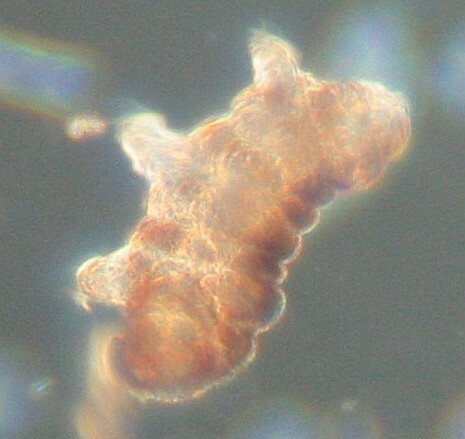 Hatched tardigrade in the restricted well slide sample proved to be Milnesium. Photos using Canon A40 digital camera with 10x WF eyepiece and 10X Achromat objective. Used Rheinberg center stop brown, and multicolor red/green annulus ring (left). Observations and photos taken 20JUN - 22JUN04. Sample taken 25MAY04 from lichen on Acer platanoides (Norway Maple) tree bark. Location 39 DEG 57.425 N, 074 DEG 10.296 W, Elevation 40 Ft. (GPS). Passaic Site Sample No. 00049. 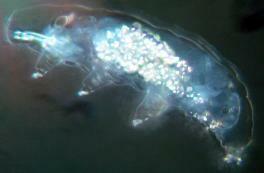 Photo on left is of Wayne, NJ tardigrade and egg. Eyepiece 10xWF and objective25x Zeiss achro. Sony Cybershot digital camera was use in multiburst function to take multiple shots while refocusing through the specimens. This allowed stacking using Helicon Focus program. Photo seems to indicate this is a Macrobiotis. Observations and photos taken 23AUG07, with tardigrade mounted in PVA under cover glass. Sample taken 20AUG07, from moss and lichen scraped from bark of Quericus alba (White Oak) tree. Location 41 DEG 00.0670 N, 074 DEG 16.516 W (GPS). Site Sample No. 00018. 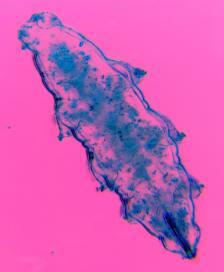 Photo on left is of Auburn, NJ tardigrade ("Clara Barton"). Eyepiece 10xWF and objective20x achro. Canon A40 digital camera was zoomed in to enlarge the specimen in the field. Photo seems to indicate this is a Macrobiotis. Video taken as well. Click on the photo to see the AVI format movie (+3 Mb ). 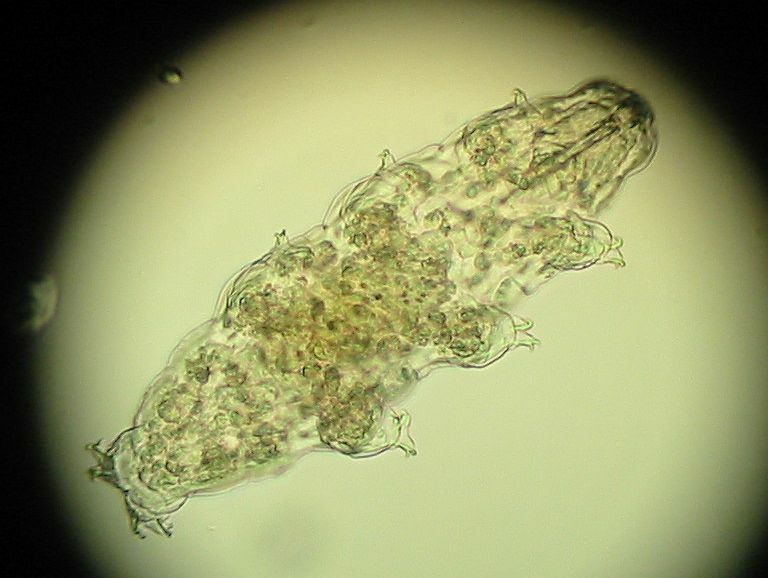 Observations and photos taken13MAR04, with tardigrade in water under cover glass. Sample taken 27OCT03, from lichen on bark of Quericus palustris (Pin Oak) tree. Location 39 DEG 41.910 N, 075 DEG 23.746 W (GPS) . Site Sample No. 00054. 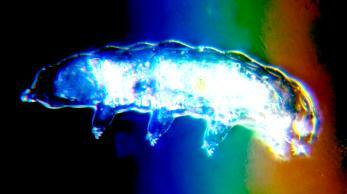 Photo on left is of Salem, NJ tardigrade. Collected on 25SEP07, and suspension made on 14OCT07. Definitely Milnesium. Permanent slide made 25OCT07, using double coverglass mount in PVA and Cytoseal 60. This is a stacked combination of 4 photos using Helicon Focus program, and Sony Digital camera. Oblique lighting with 10x WF eyepiece and 25x Zeiss achomat objective. Location 39 DEG 34.209 N, 075 DEG 27.864 W. Elevation 22 Ft, using GPS. Site Sample No. 00007. 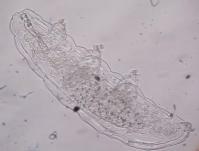 Photos to left are of Somerset, NJ tardigrade No. 2 ("Rama1"). Eyepiece 10xWF and objective LOMO 10x achro. Canon A40 digital camera was zoomed in to enlarge the specimen in the field. These show body shape and rear claws indicating Ramazzottius genus.Measured 279 microns. Digital sharpening was used. 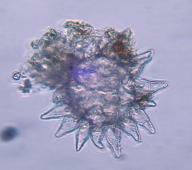 Photos directly below are of Somerset, NJ tardigrade No. 1 ("Hairy Claws"). Eyepiece 10xWF and objective LOMO 10x achromat. Canon A40 digital camera was zoomed in to enlarge the specimen in the field. Photo lower right of "Hairy Claws" shows close up of head and mouth parts. Bottom photos on left shows hair on the claws. Is this fungus? Mouthparts and size (372 microns) indicate Macrobiotus genus. Macrobiotus hufelandi probable, based on macroplacoids. Digital sharpening was used. 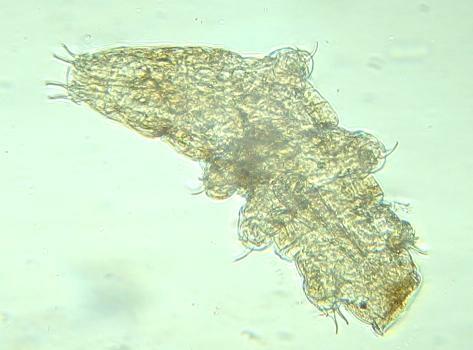 Specimen was taken from Acer platanoides (Norway Maple) lichen on tree bark, on 30MAY03. Observation and photos made 13JUN03. Location 40 DEG 34 min , 74 DEG 37 min (Aeronautical chart- Philadelphia VFR Terminal Area Chart 57th Ed. February 20,2003). Site Sample No. 00023. 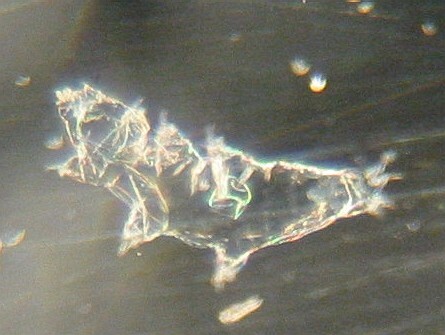 Above photo LEFT of Newton, NJ tardigrade ("Newco") egg. Eyepiece 10xWF and objective20x achro. Egg looks like might be Macrobiotus aerolatus (Kinchin). Egg spikes measure from tip to tip 14.6 micron. Egg diameter measures from wall to wall 10.9 microns. Above photo RIGHT of Newton, NJ tardigrade ("Newco"). 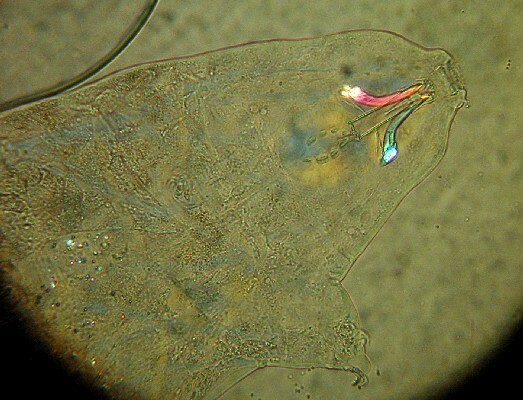 Eyepiece 10xWF and objective20x achro.Canon A40 digital camera was zoomed in to enlarge the specimen in the field. 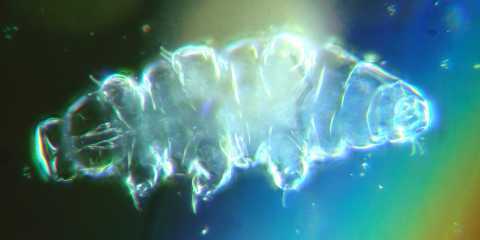 Claw type seems to indicate this is a Macrobiotis, and based upon macroplacoids, could be M. hufelandi. . Tardigrade length measures 32.9 microns. 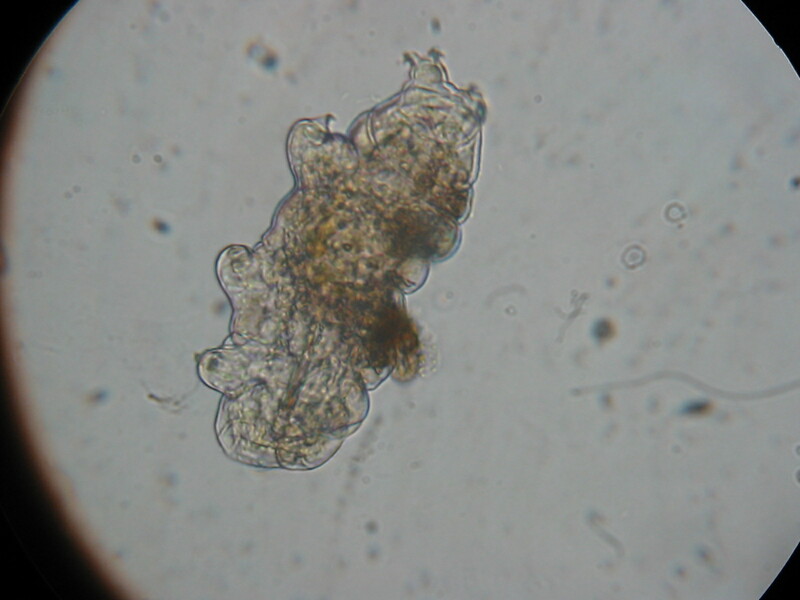 Observations and photos taken 25JAN04, with tardigrade in water under cover glass. Sample taken 14NOV03 from moss on rock surface. Location 41 DEG 02.866 N, 074 DEG 44.200 W, Elevation 623 Ft. (GPS). Site Sample No. 00055. 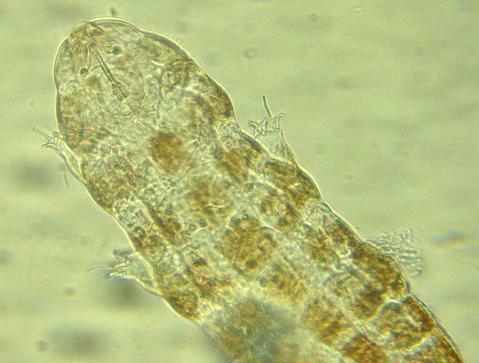 Photos on left are of Linden, NJ tardigrade. Collected on 07APR08, from lichen on bark of unknown species of tree. Suspension made on 11APR08. Definitely Milnesium. Permanent slide made 12APR08, using double coverglass mount in PVA and Cytoseal 60. Each is a stacked combination of 4 photos using Helicon Focus program, and Sony Digital camera. Top is Brightfield and bottom is Oblique lighting with 10x WF eyepiece and 25x Zeiss achomat objective. Location 40 DEG 38.03 N, 074 DEG 16.17 W. Elevation 62 Ft, using Magellan Topo Maps program to determine coordinates and elevation.